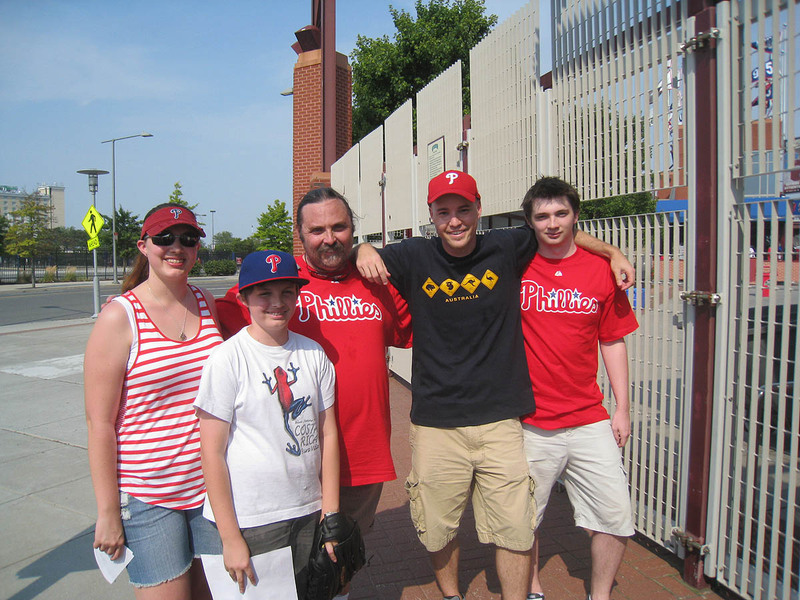 In the photo above, Emily (age 18) is on the left, Nick (age 21) is on the right, Alex (age 13) is standing in front, and their father Ray (age unknown) is in the middle. Ray’s wife Donna had attended the previous game, but she wasn’t feeling 100 percent when it was time to leave for this one, so she regrettably decided to skip it. Sanches wears uniform No. 48, so in the photo above, you can see him standing second from the right. Meanwhile, Nick and his siblings weren’t trying to snag baseballs. They were sitting in the shade near the back of the section . 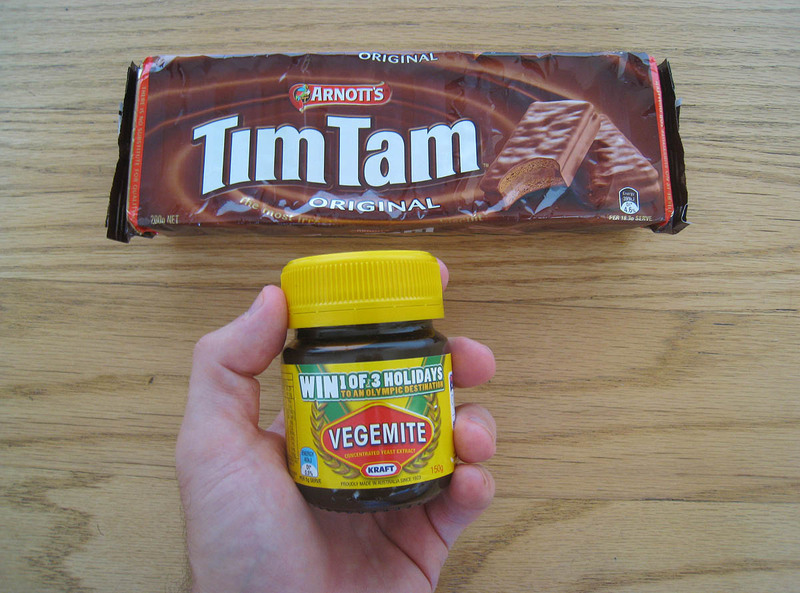 . .
Vegemite! Ha-HAAAA!!! Awesome. I once had a taste at a friend’s place and hated it, but I’m willing to give it another shot, especially now that I own my very own jar of it. As for the Tim Tams, those got completely melted in my car, but I took Ray’s advice and stuck ’em in the fridge when I got home, and that did the trick. They were delicious, and I polished them off with my girlfriend in one sitting. 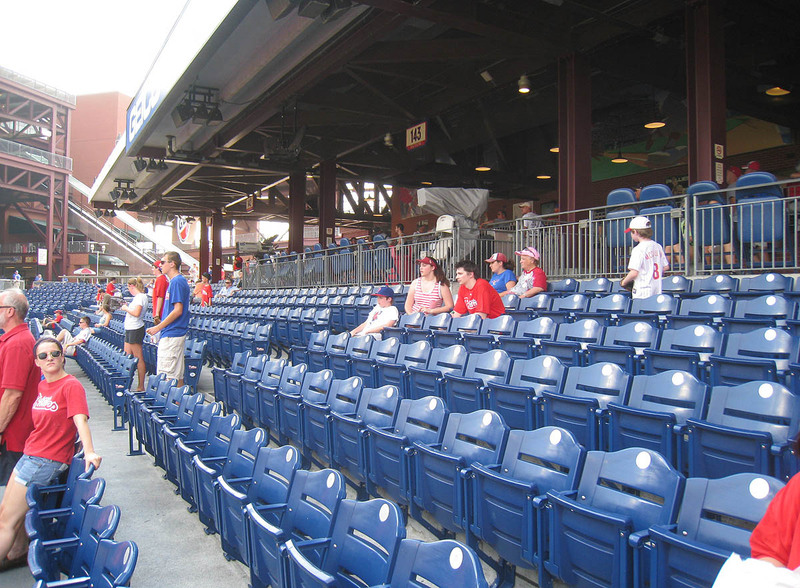 But anyway, let’s get back to Citizens Bank Park, shall we? 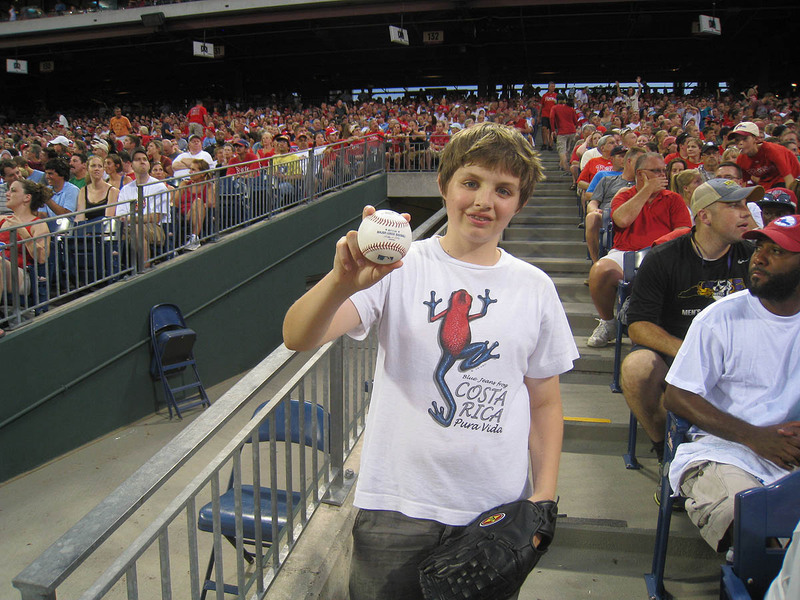 Ray had snagged two baseballs at the previous game, but he didn’t get any at this one — and that was fine. He wasn’t heartbroken. He didn’t have a streak to maintain. He and his kids just wanted to hang out and watch me do my thing, knowing that they’d end up going home with just about all the balls that I caught. 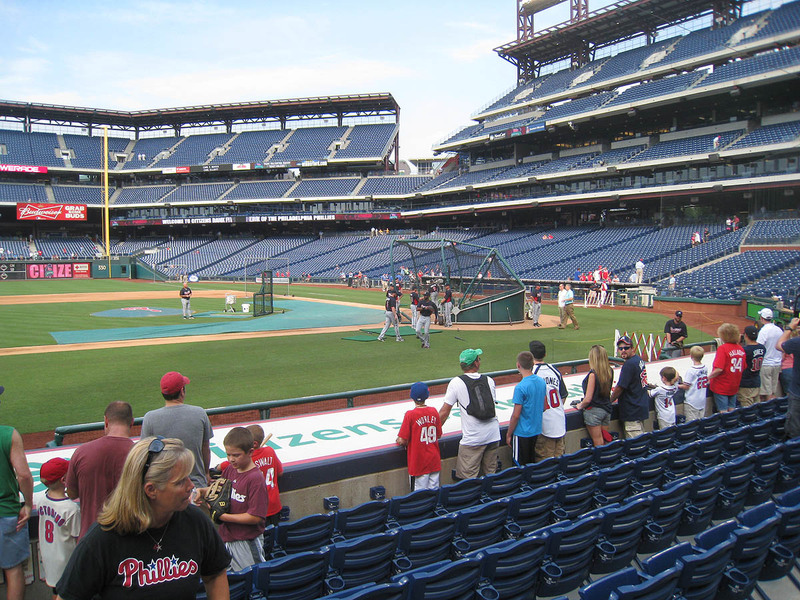 Halfway through the Phillies’ portion of BP, I snagged a home run that deflected right to me off a man’s glove in the front row. Then, several minutes later, I moved 15 rows back for Hunter Pence and made a running/jumping catch on one his many bombs. 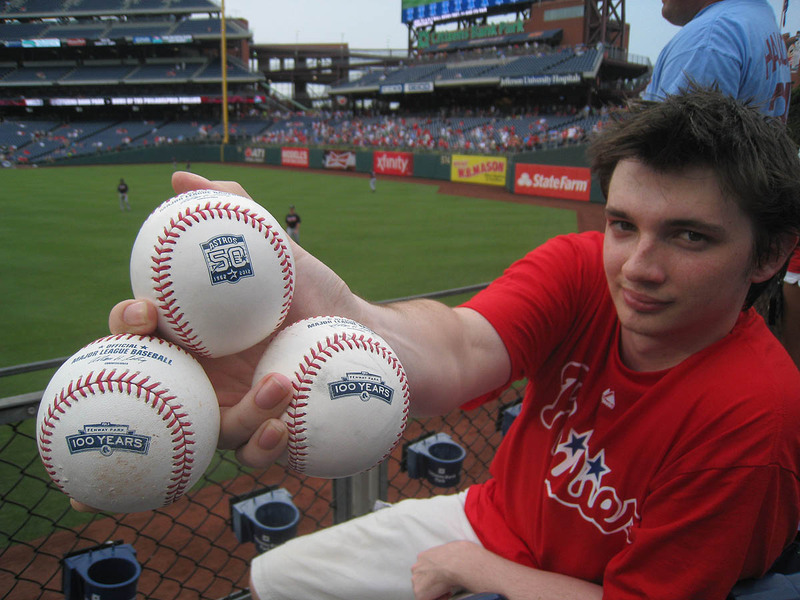 At the previous game, I’d given away the balls as soon as I caught them, but at this one, at least during BP, I tossed ’em all in my backpack and distributed them later. When the Braves took the field and started playing catch, I ran to the seats behind their dugout on the 3rd base side and got Chipper Jones to throw me a ball. He was standing right next to the batting cage, and I was half a dozen rows back. I took the following photo after I caught it . . .
. . . so as you can see, he had to put a little velocity on it in order to reach me. I stuck that ball in a separate compartment of my backpack so that I’d remember later on which one it was. 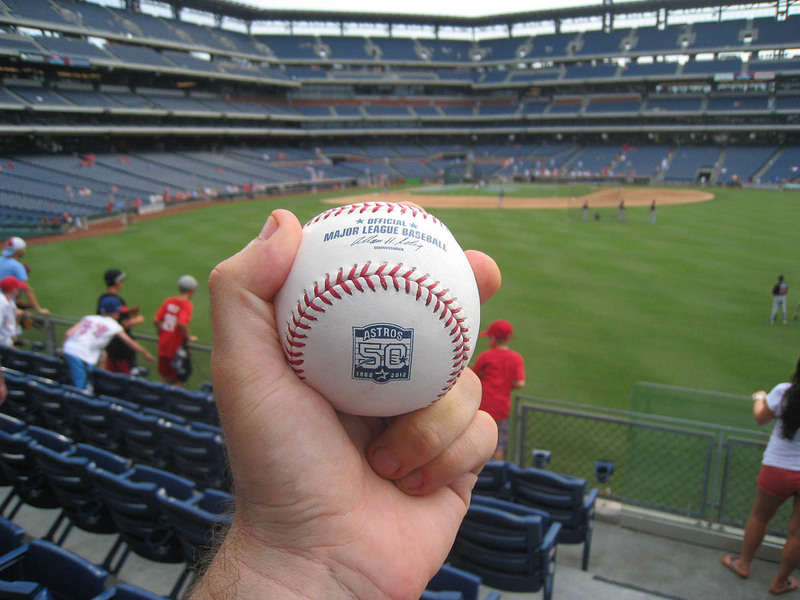 The ball from Chipper was my 5th of the day, and I should’ve gotten another one at the dugout. Jack Wilson chucked it to me from about 150 feet away, but it sailed 10 feet over my head. I still would’ve gotten it, but it took a horrendously unlucky bounce off a seat and deflected right to a middle-aged woman with no glove. Aarrghh!! Pretty sweet, huh? And get this: Nick and Emily snagged all three of those balls on their own! 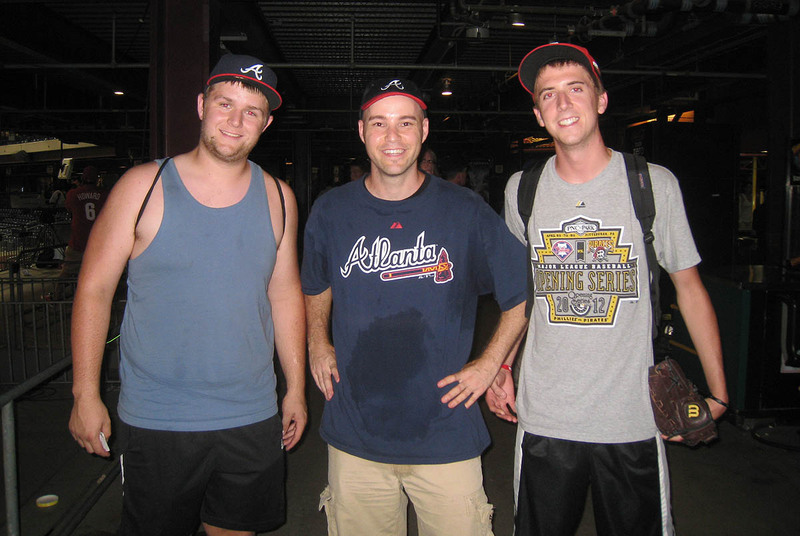 Emily got one tossed by Jonny Venters, and Nick snagged two Jason Heyward homers WHILE SITTING DOWN in the front row. The first one happened to land near him, and the second was a moonshot that landed in the second deck and bounced right down to him. That ball had been sitting on the warning track, and I was lowering my glove trick when Randall Delgado walked over and tossed it to me. Two weeks earlier, the Braves had played a three-game series in Boston, so I can understand why they had those balls, but the ones with the Astros logo made no sense. The last time the Braves visited Houston was in April. After BP, I got my 9th ball of the day at the 3rd base dugout from Braves coach Scott Fletcher. 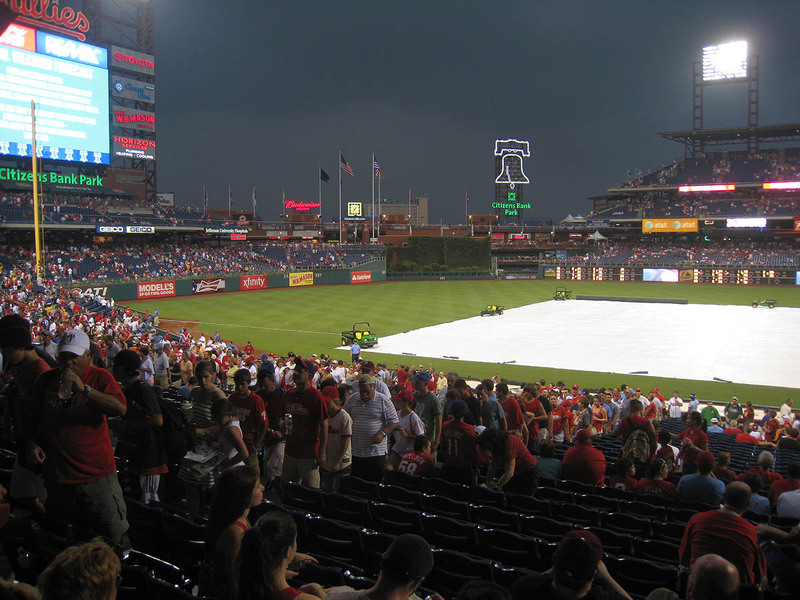 I figured they knew something that I didn’t, and when I saw them start to roll the tarp onto the infield . . .
. . . I was convinced that something was up. In the photo above, do you see the fan in the red “PENCE” shirt? That’s Nick, sitting next to his family, and guess what? Those were our seats for the game. As comfortable as they all appeared to be, I felt bad about insisting that they move, but I knew it had to be done. It was going to rain, and I told them that if we acted fast, we could grab some empty seats at the back of the section, under the overhang of the second deck. They didn’t argue. If anything, they appreciated the warning, and we quickly relocated to the second-to-last row. It wasn’t raining yet, but as you can see, the sky had gotten much darker, and people were making their way up the stairs. 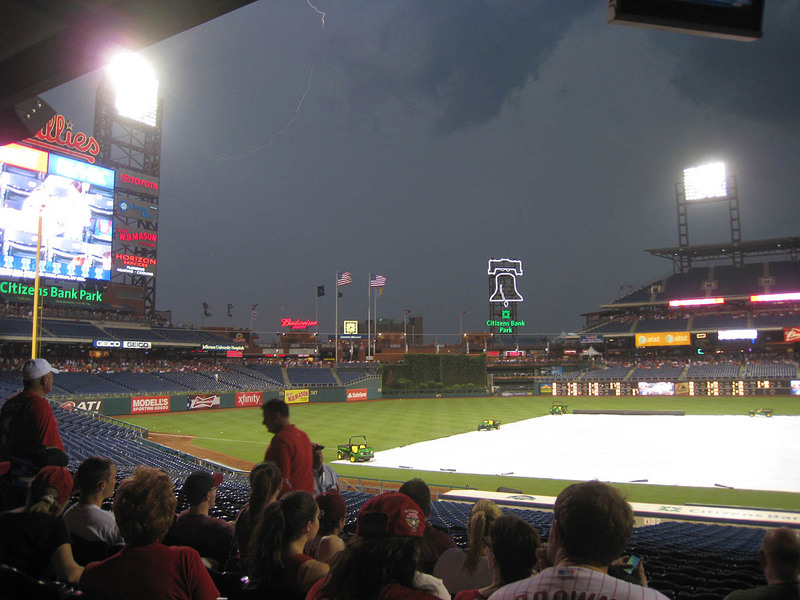 The public address announcer had just told everyone that a severe weather front was about to hit, and everyone was forced to take cover. Did you see the lightning in the photo above? There’s a faint/curved bolt coming down from the top, just left of center. Also, did you notice the American flags blowing like crazy? Surprisingly, it didn’t rain hard, but it was VERY windy. After a 58-minute delay, this was our view during the game . . . It was a 3rd-out ball from Braves shortstop Andrelton Simmons (who, by the way, has one of the strongest infield arms that I’ve ever seen). 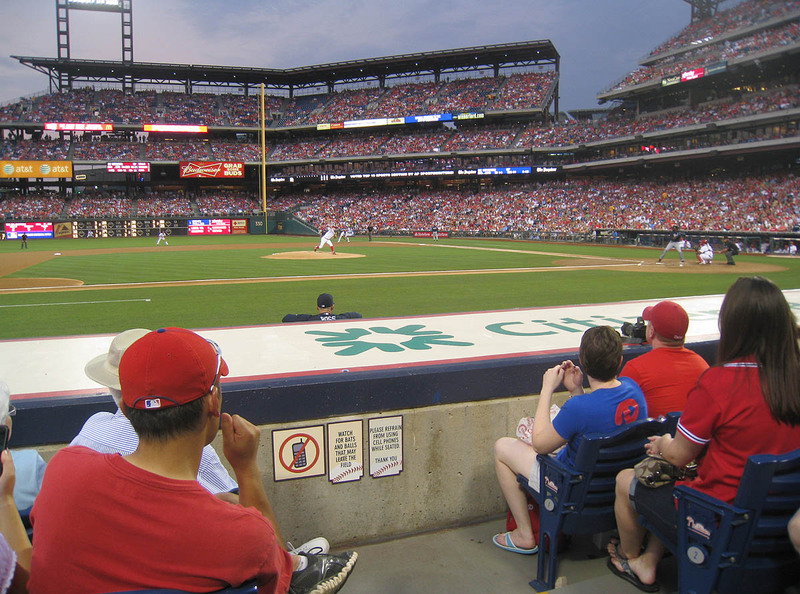 With two outs in the bottom of the 2nd inning, Jimmy Rollins had been thrown out trying to steal 2nd base. Tommy Hanson had pitched that ball, Brian McCann had caught it and fired to Simmons, and now we had it. Pretty damn cool. Fast-forward several innings . 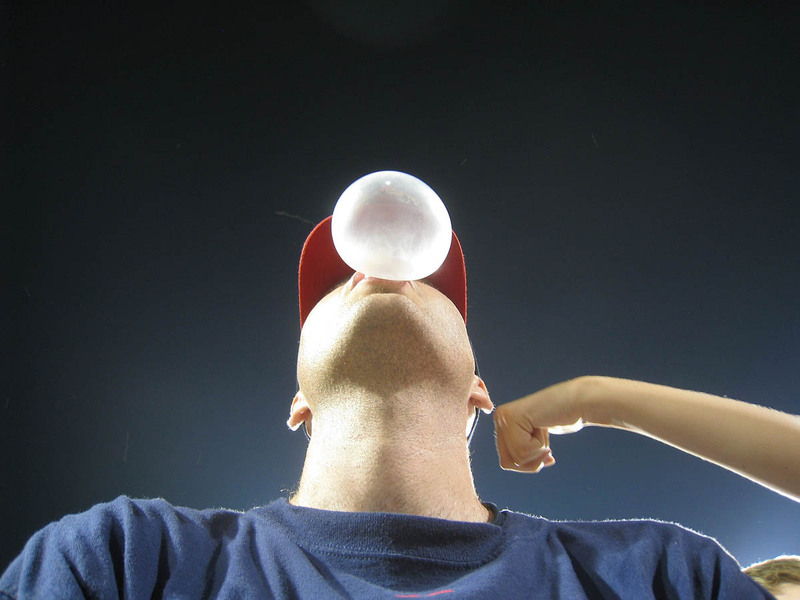 . .
That wasn’t a major accomplishment because he was tossing out gum to everyone, but something funny happened a little while later. 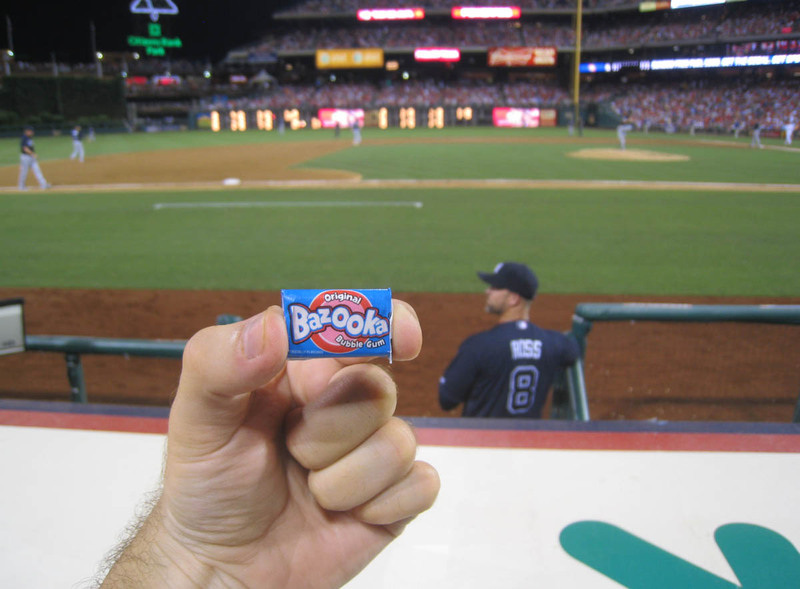 During an inning break, I walked down to the front row and told him that I needed more gum. “I just gave you some!” he said. “You are high maintenance,” he said. His tone was serious, but I could tell — or rather I assumed — that he was amused by the whole situation. I sure was. And my request paid off. Ross disappeared for a moment, then poked his head above the roof and flung three more pieces of gum at me. That was all I needed to keep the flavor strong and blow respectable bubbles. Here’s one . . .
That was my 13th and final ball of the day. I should’ve gotten another after the game, but I happened to look down for a split-second, JUST as someone inside the dugout rolled a ball across the roof in our direction. (I think it was Cristhian Martinez.) I wasn’t upset about missing it because Alex grabbed it! He narrowly beat out another fan for it as it rattled around on the ground in the front row. I forget how many balls Mike snagged — it was either four or six — but I know that Jerome got three. Jerome had recognized me when I first ran inside the stadium, and he did some trash-talking, but I could tell that it was all in good fun. I’d snagged 13, and they’d snagged 4, but as you can see, only 15 of the 17 total balls are pictured above. 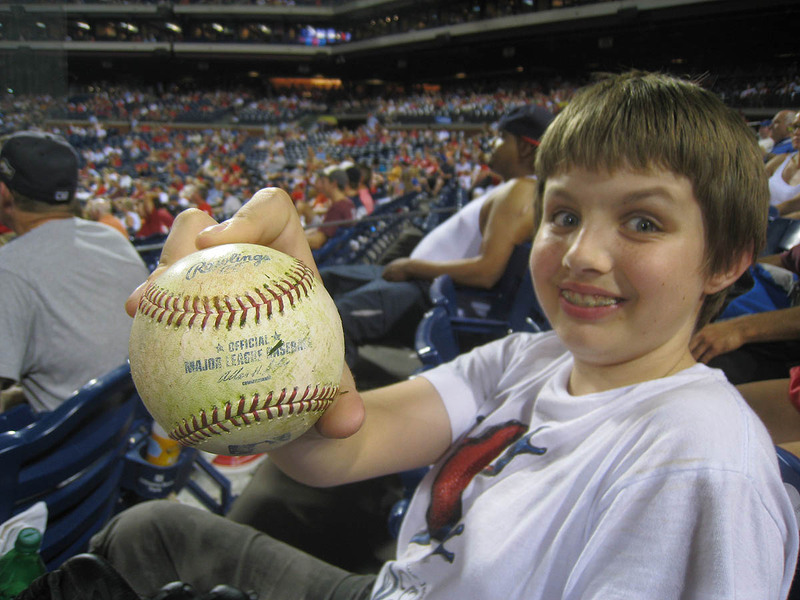 That’s because (a) I gave one to a little kid in our section who hadn’t gotten one and (b) Nick had forgotten to take the Chipper Jones ball out of his pocket — just as well because it was important to keep that one separated from the rest. 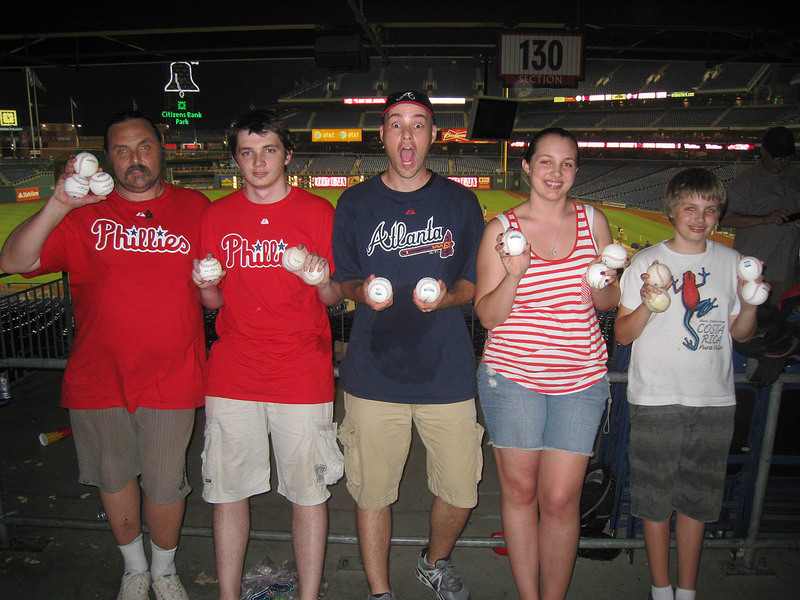 Of the 13 balls that I snagged, I gave away 11 — one to the random kid and ten to my new best friends from Australia. They let me keep the two commemorative balls, but best of all, they told me that I’m welcome anytime to visit and stay in their home. 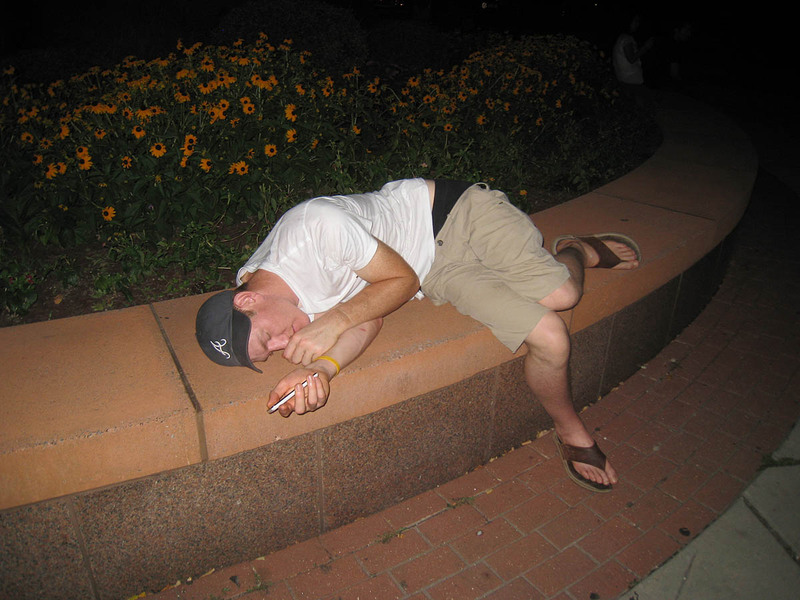 On a final note, don’t drink too much at baseball games or else . . .
. . . you might pass out and end up getting made fun of on my blog. • 260 balls in 34 games this season = 7.65 balls per game. Are you going to a game at Comerica Park this year? Zack- Do you have dreams of moving to Philidelphia from New York? Also what happened about that job interview thing on twitter? I really do hope you didn’t get fired. whens the next time you’ll be in Milwaukee? No, but every season I “joke” about moving to Baltimore. Can you imagine if I lived halfway between D.C. and Baltimore and attended every game? I’d snag 2,000 balls. (But the rest of my life wouldn’t be nearly as fun.) I’m not getting fired. I’m getting “replaced” as of next week, so if anyone wants to hire me . . .
when u got the line up cards after the reds game, did u ask for them? If not how did u get them it would be a really cool thing to have. Yes, I asked. I always ask and usually get ignored, but sometimes it works. I have the Baseball and Watching Baseball Smarter and they are 2 of the best baseball books I’ve ever read. In the Baseball where did u get all the unique baseballs from the different stadiums? 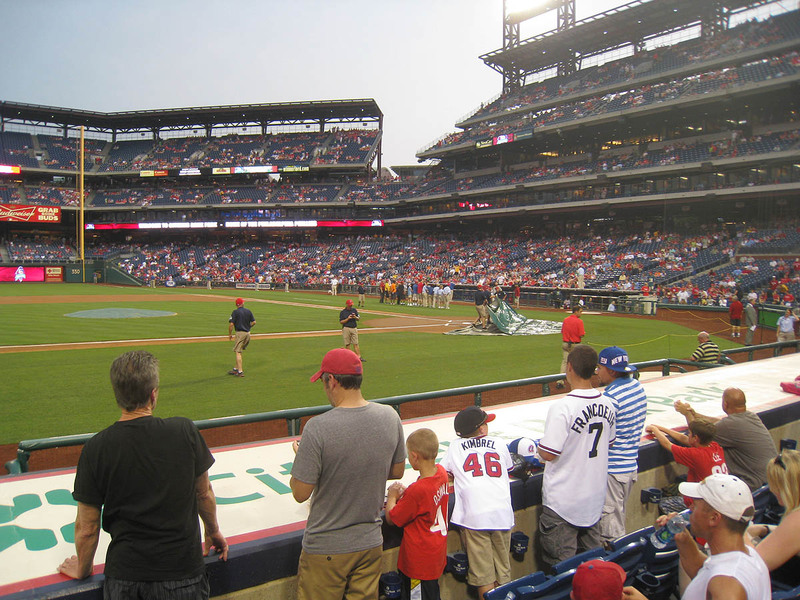 Whats the first baseball game you ever went to? 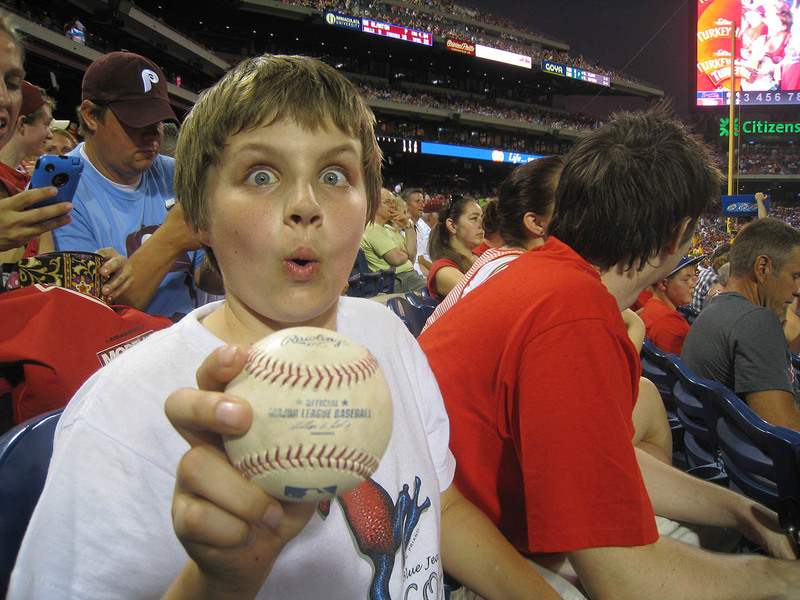 and did u catch a ball? Thanks so much. Most of those balls belong to (and were photographed by) a friend named Zach who runs a website called bigleaguebaseballs.com. My first game was Bat Day at Yankee Stadium in 1984, and no, I didn’t catch a ball. While, McDonald’s is always a possibility (not for you lol :0) I hope you find a job soon. Apply for a managerial degree, and send a application to the Yankees front office, and be like the president of ballhawking at Yankee Stadium or something. Make 5 sections exclusively for ballhawks in all the prime areas for ballhawks. If that doesn’t work try the Mets. You’d at least probably get free season tickets if President of ballhawking doesn’t work out. I’ll be attending the Tigers/O’s game this Sunday at Camden Yards. I’m excited as it’s the first time I’ve ever been to the stadium. I have a couple of questions in which I checked your blog about and didn’t find answers. 1) Will you be at the game? 2) How early do the players walk from the hotel to the stadium? 3) Do you know which hotel they use? 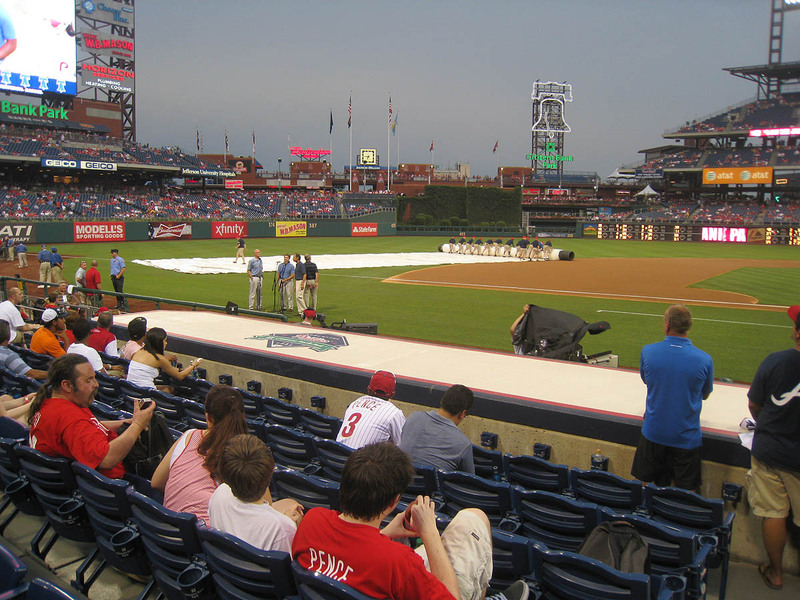 4) Does the whole stadium open 2 hours prior, or just the outfield (like Citizens Bank Park)? 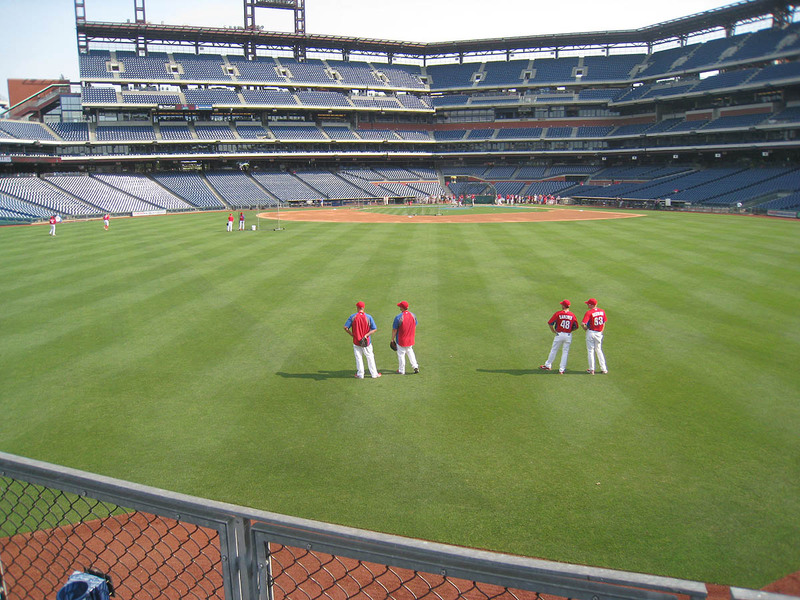 5) Do you think there will be batting practice as it is a 1:35 game? Thanks, and I hope I didn’t bug you too much. I hear you about the heat. I was in Washington that day for a day game. It was on-field photo day and it got up to 108 degrees on the field while I was wearing a t-shirt with a jersey on top. Is this the hottest game you’ve ever been to or would that be the game when you caught Mike Trout’s first MLB home run? I met Alex Patino today in the bleachers—he is one entertaining individual! Love the passed out drunk dude. And Nelson. Thanks so much for linking my entry! It has really helped a lot. We’ve been finding weird baseballs here in the minors this year, too…a friend of mine has snagged a couple of Astros 50th Commemoratives, a Target Field Commemorative, a couple of Dodgers Commemoratives, and the kicker…a 1997 NL Championship Series baseball, all here in AA ball. 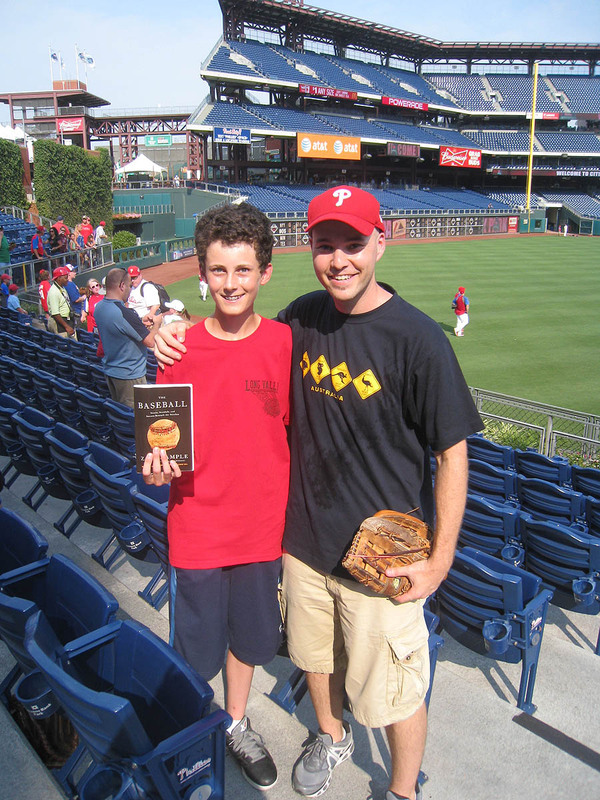 No idea how they got there…especially the 15 year old NL ball! Zack, doesn’t your family own the book store? How can you get laid off from a family job? I didn’t even think that was possible. Is it because you take off too much to attend baseball games?? I hardly ever find Easter eggs because New York. Ohio is good for eggs. I remember grabbing a bunch on my record day last year in Cincy. Not sure about Miller Park or Wrigley. 1) No. I’ll be on a plane to Los Angeles. 2) I have no idea. I don’t go for autographs. 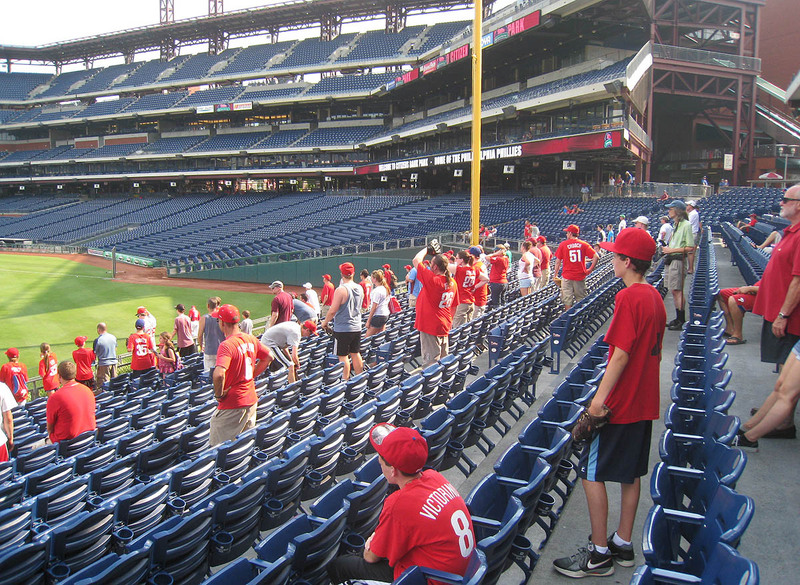 4) Everyone gets in two hours early; non-season ticket holders have to stay in right field and center field for the first half-hour. 5) I predict that there will not be BP. 6) Don’t sit next to Tim Anderson. That is VERY weird. Wow. Yes, my family owns it. 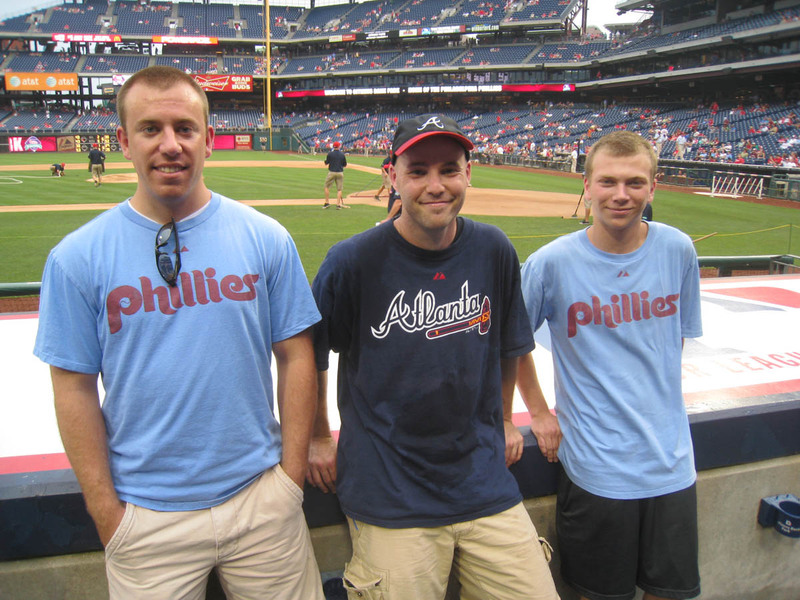 None of them care at all about baseball, and they claimed to need me to be there full-time. I told them I can’t work FULL-time because then I’d never get to attend batting practice, and that a full-time schedule would effectively end my baseball collection, and they were like . . . see ya. I’ll continue to do part-time work for the store (thankfully there are endless projects for me there), but I’m now officially looking for other employment. Life is funny. 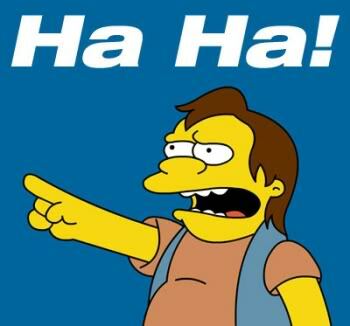 Nelson is the Simpsons character saying HAHA! To the drunk passed out guy. 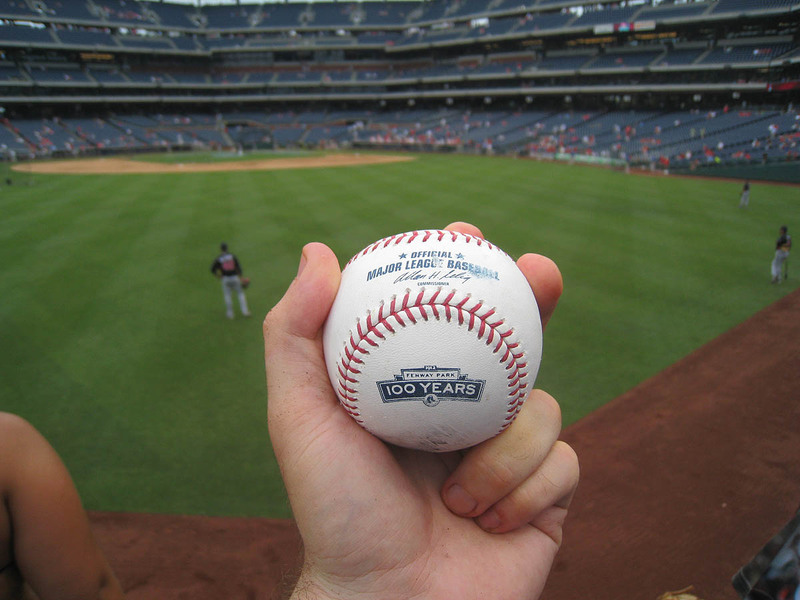 I had no idea the Braves were using commemorative balls or else I would’ve started snagging again this year. Turner Field has been pretty empty some nights thanks to the Braves overpricing their own tickets this year, so maybe I’ll get back in it soon. Glad you got Chipper to hook you up. That’s certainly a special ball. Also, David Ross is a real character. 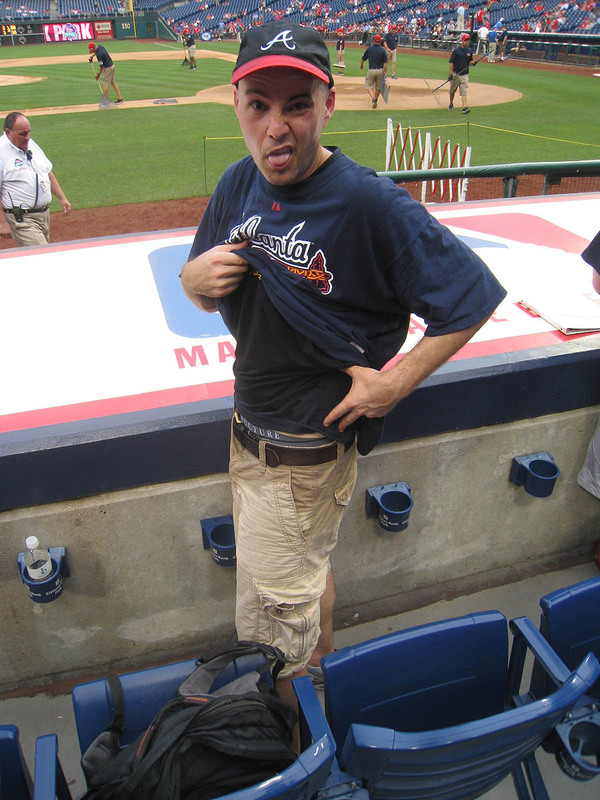 He’s always been the guy that keeps things loose in the Braves’ clubhouse. 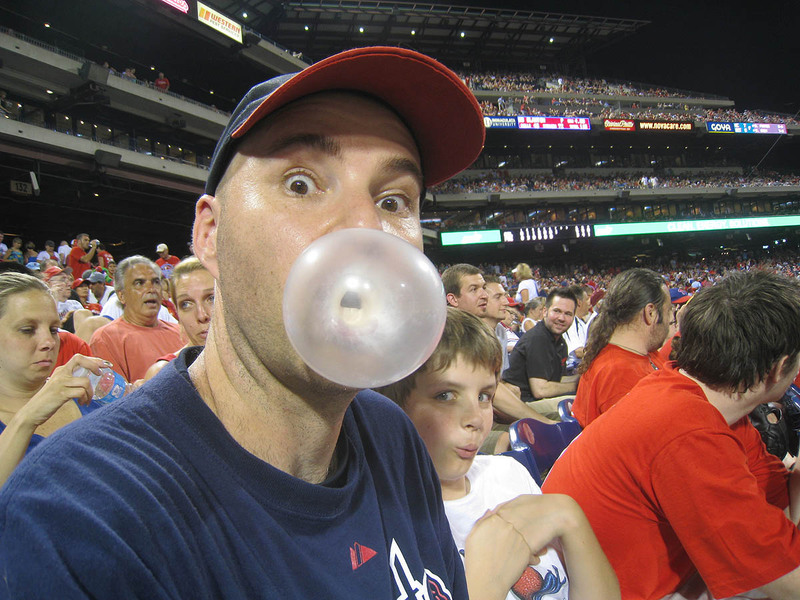 Hi mr. Hample your my idol!! 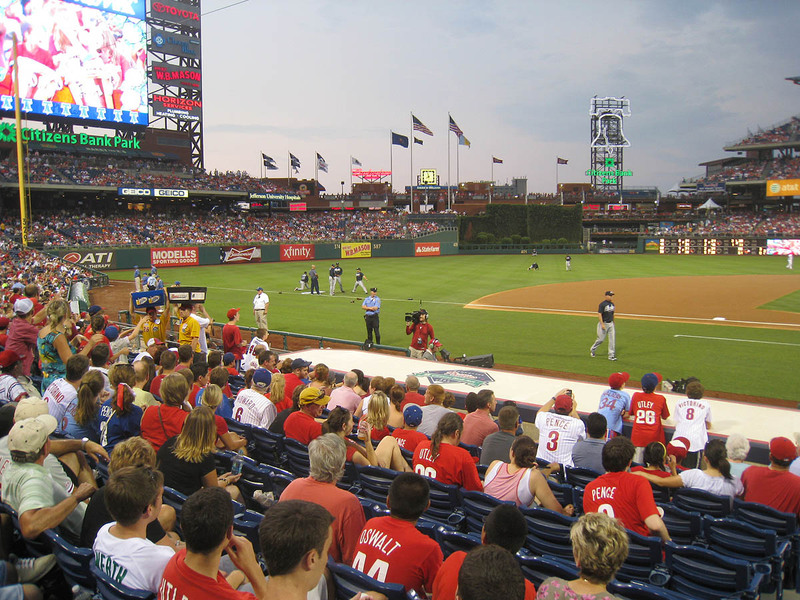 But I’m going to citizen bank park this weekend for the phils- giants series do u have any tips for me?? If so could u please email them me?? 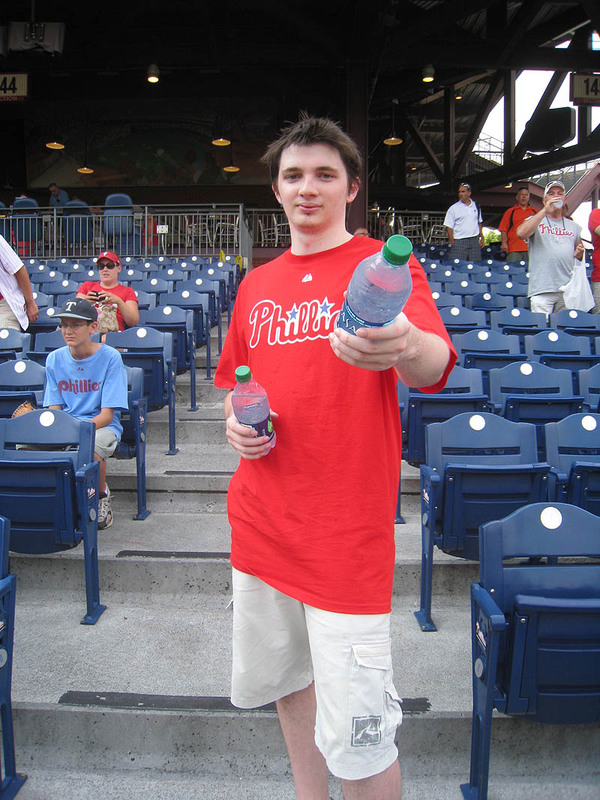 Ps- GO PHILLIES!!! !